After Michael Gough’s divorce in Utah, he found himself living 1,000 miles away from his four year old daughter. Not satisfied with simple telephone calls in between physical visitations, he sought a court order allowing “virtual visitation” through electronic communication. Eventually, with the assistance of Utah attorney, Joyce Maughan, Gough successfully lobbied the Utah legislature to pass legislation specifically allowing the courts to order virtual visitation. Michael is now living in Wisconsin and is seeking similar legislation here. Recently, SB 244 was introduced and referred to the State Senate Committee on Health, Children, Families, Aging and Long-Term Care. Is this bill a good idea? Is it even necessary? The second question is easier than the first; the bill is not really not necessary. Wisconsin courts have broad discretion to fashion orders that serve the best interests of children. In re Custody of H.S.H-K, 193 Wis. 2d 649, 533 N.W.2d 419 (1995). 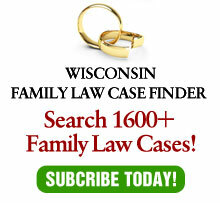 Courts commonly make orders regarding telephone time with parents, especially in cases where the parents live so far apart that frequent physical contact with one parent is not possible. Extending these orders to include other types of electronic communication is not much of a stretch. In many, if not most cases, parents do not need a court order to let a child have contact with the other parent. For those high conflict cases where one parent might – or does – interfere with the other parent’s contact with the child, a new statute really is not necessary as present law is sufficient to give a court such authority, if requested by one of the parents. Even if not necessary, would the law do more good than harm? The only potential harm would be if the law would be used by a court to make removal of a child easier. While the proposed legislation specifically prohibits a court from using electronic communications as a factor in allowing or prohibiting moving away from the other parent with a minor child, it is conceivable that a court could be more inclined to allow a move by fashioning an order allowing such communication in exchange for granting the removal. While such tacit reasoning by a court is possible, a presumption must be made that courts will follow the strict prohibition of the statute prohibiting such consideration. Other than this fear, which is specifically addressed by the statute, it is difficult to conjecture any harm which the proposed law may cause. Like chicken soup, it may not cure any problem with high-conflict cases where the parents can not even agree on contact with the other parent, but it will not make the situation worse. For those limited situations where a trial court may need guidance, or may be uncertain of its authority, the law may indeed be beneficial. Any law which may help some children, while not creating any harm to others, is certainly welcome.